The right accommodation downtown Calgary! Centrally located, we are close to trendy 17th Avenue district with its numerous shops and restaurants, Saddledome, Stampede Park, Downtown Business District, The Talisman Centre, Calgary Tower, Glenbow Museum, EPCOR Centre and the TELUS Convention Centre.We offer deluxe downtown Calgary hotel accommodation at affordable prices! Rent one of our guestrooms and get a spacious suite every time! Our rates include complimentary high-speed Internet access, business centre access, fitness centre access and parking. Start your day off right! Join us for our complimentary hot buffet breakfast!Earn IHG Rewards, Air Miles or Aeroplan Points! 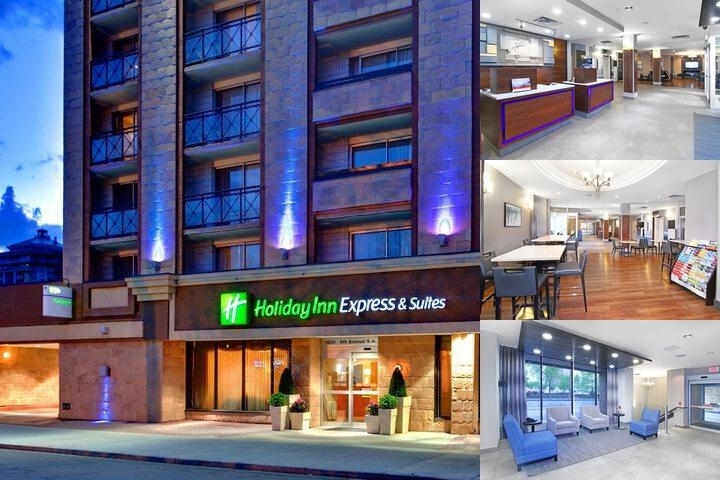 Newly renovated, 57 room hotel located in Downtown Calgary, offers complimentary parking, hot buffet breakfast and WiFi.You'll enjoy an unbeatable location when you stay at the Holiday Inn Express Hotel & Suites - Calgary, just 15 km from the Calgary International Airport (YYC). Our hotel is also only one block from Calgary's Light Rail Transit (LRT).Want to be in the center of the action in Calgary, Alberta? Our hotel is just minutes from TELUS World of Science, the Scotiabank Saddledome, the Glenbow Museum and other popular attractions in downtown Calgary. Our hotel's guests can see a concert at the Jack Singer Concert Hall, visit history at the Mewata Armoury and shop in the CORE shopping centre or Stephen Avenue Mall.Business travelers also enjoy our close proximity to TELUS Convention Center, Shell Canada, SNC-Lavalin, NEXEN Inc., Husky, ATCO, NOVA Chemicals, Halliburton, the main branch offices for Scotia Bank, RBC and Alberta Treasury Branch, as well as other numerous businesses in downtown Calgary. Lodging here gives you easy access to our 430-sq. ft. meeting room and the business centre.We go beyond the other hotels in Calgary to offer top-quality amenities, from the complimentary hot breakfast bar, fitness centre and currency exchange service to each room's free high-speed Internet access and balcony overlooking downtown Calgary. Our hotel's rooms feature triple-sheeted beds, a workspace, a 42-inch flat screen TV, a fridge and a microwave. We look forward to serving you.Features Unlike other hotels in Calgary, Alberta, our hotel serves a complimentary hot breakfast bar. You can enjoy a fresh cup of 100% Arabica Smart Roast coffee with a signature cinnamon roll, eggs and more! Continental Hot Buffet Breakfast. 6:30am to 9:30am on Monday to Friday. 7:00am to 10:00am on Weekends and STAT holidays.